But Can It Survive Dogfoot? Attention Dog Lovers! This Is Weekend Dog Blogging #28! To see fun dog photos and discover yummy new food blogs, head over to Sweetnicks on Sunday night for the complete roundup. And at The Friday Ark you'll find dozens of links to everything from dogs to dwarf hamsters. Hungry for more than pooch pictures? Don't miss Weekend Herb Blogging #26 at Kalyn's Kitchen. I know. I realize the weekend has come and gone. But yesterday afternoon a strange little rain/wind/hail/thunderstorm blew through the farm and knocked out our power. It came back on a few hours ago, but just blinked out again. Thank goodness for my battery backup! Dwarf hamsters? Dwarf hamsters! Could they survive dogfoot? Luckily your dogfoot is not as freakish as this dogfoot! This comment has nothing to do with dogfoot. Did you happen to see on the news, the two sheep in New Zealand who had eluded being sheared for about six years? It is a wonder they could still stand upright with all that wool. I thought of you when I heard about the storm - did you bring Donkey Dan into the house for the nite - i would have. 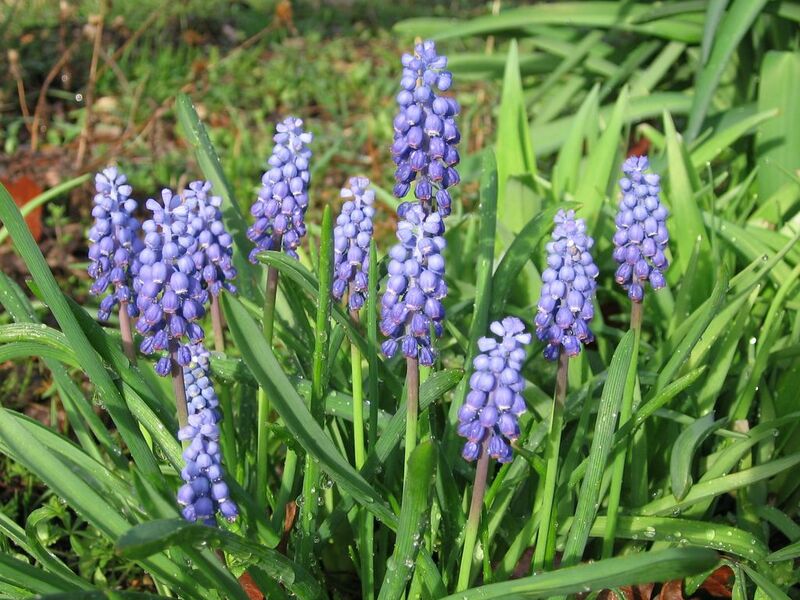 I love grape hyacinths - ours our u too. i used to have the giant ones. It looks like you have rally nice old split rail fence? 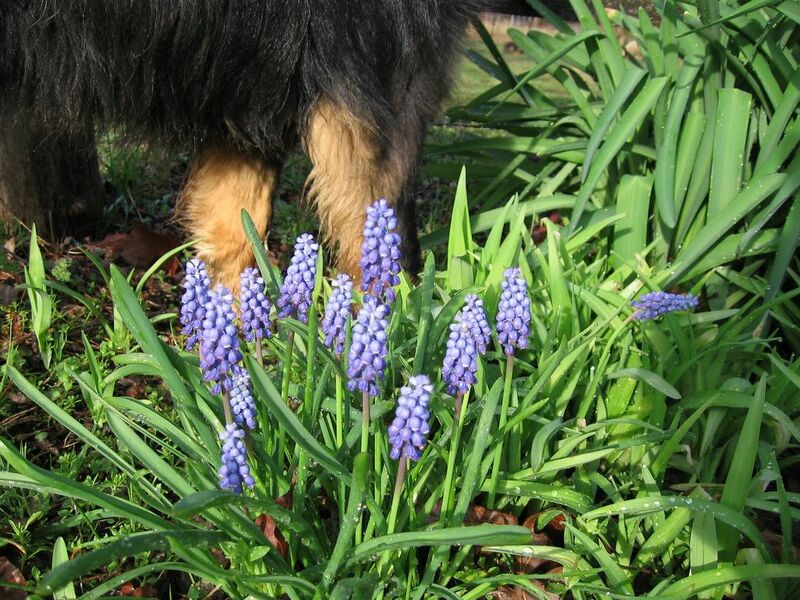 What happy little hyacinths, and I love the doggie paws looming in the background. What a lovely sign of spring! What you folks need is some nice chickenz. A few working chicken claws can keep your soil nice and loamy, without digging up the vegetation. When you have had it with all that fur and bone burying action , ask yourself if those city ordinances really mean business. A chicken in every garage, isn't that what they used to say? What's that Whitey? They said what????? No, no, couldn't be. Enough with the cats and dogs. They bark and mewl and they don't lay any eggs. Think about it, and take a chance with a chicken. 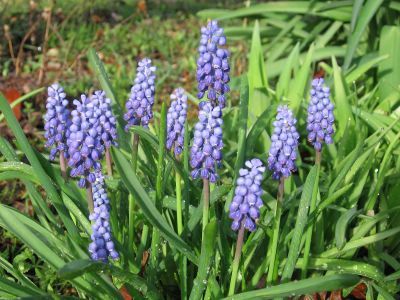 The Grape Hyacinths display a lovely colour.Trespass can be a problem!